Entering the Salon, I saw a mix of ramshackle neo-Victorian elegance and retro-vintage, as if someone had moved into their great-aunt’s attic and was in the middle of converting it into a 70s rec room. A generous velvet upholstered love seat with ebony scrolling leaned against the exposed brick wall in the small receiving room. Past the heavyset velvet curtain in the center of the space was the rest of the salon. Wide shelves of vinyl records towered above me and a turntable hid behind some mirrors in the corner; one of Romain’s hobbies is spinning tracks and editing his own mixes. Tiny porcelain figures, standing antique lamps, rounded portrait frames and a hand-welded window decorated the walls. A pair of enormous gold-encrusted mirrors stood floor-to-ceiling angled beside their respective barbershop chairs. Between them by the street-side window, a curved sheet of smooth metal hung suspended in midair with wires and pipes. This contraption appeared to be a portion of a WWI aeroplane wing, but in actuality is the salon’s sink. Water flowed in from one set of pipes and drained out discreetly; when the sink isn’t used, people can sit in it like a swinging hammock. Romain, a mild-mannered Frenchman who is all elbows and knees, ushered me in, thanking me for being able to accommodate the late hour; I had arranged to have my hair cut, earlier that day and luckily, a last-minute cancellation enabled me to get my haircut done that evening. Getting a New York City trim can be an expense, but at Romain’s parlor, our time passed convivially as if we were old friends catching up. Romain gets clients only through word-of-mouth and the occasional daringly curious passersby from the street. Still, he has been a hair stylist for over ten years in the city, and I can understand why people become repeat customers. We chatted lively about his life in provincial France, before traveling to America with the dream of owning his own salon. Romain’s mannerisms were small and contained, yet fluttered with a sort of schoolboy pride as he gleefully showed me the series of uniquely-designed tools of his own creation: foot-long metal combs that held extended teeth to measure out locks for perfect straight-lined cuts, razor blades with pearl handles, scissors that resembled a child’s drawing of an alligators’ elongated jaws. He then turned on some music, a mix that he just finished: waves of jazz mingled with the brass sounds of big band. Leaning my head into the cool dip of the aerodynamic sink, my neck was perfectly balanced as the jet of warm liquid flowed through my hair. Romain’s touch is precise, stroking tendrils away from my ears and the baby-wisps along my forehead as he washed my locks. He tousled my hair a bit with a plush towel, before taking those gadgets and applied them to his work. The hairdryer looked to be the most modern of his tools, and once dried, I angled my chin in the mirror, my double smiling back in return. My steampunk sartorial experience combined aesthetic pleasure of the object and the body: not merely looking or listening, but experiencing all aspects of the sensorium. Society, according to Michel Foucault, is built upon four different types of “technologies”: the technologies of production, the technologies of sign systems, the technologies of power, and, finally the technologies of the self.1 Steampunk subculture engages in all four: through the production of objects and the subversion of sign systems, the aesthetic movement attempts to subvert current systems of power through a refocused attention upon the self. Romain’s and his work, in particular, is an example of the steampunk’s everyday practice of intellectual and physical grooming and personal self-reflection. This dual methodology of self-care is referenced in the Greco-Roman adages “Know thyself” and “Take care of thyself.” The former concerns the fostering the internal, the intellectual: the sophistication of the mind through self-reflection, ethical conduct, and attentive learning. The latter phrase is the daily practice of this self-knowledge that takes into account eating, grooming, and sartorial style. Indeed, while steampunk lifestyle is most commonly associated with forms of dress, other embodied practices, such as a haircut, are also part of one’s lifestyle. Many steampunks I interviewed believed in the social power of sartorial style as a form of individual self-agency. The willowy redheaded Mary Holzman-Tweed, a prominent member of the New York City community who arranges monthly social fetes, explained to me how steampunk is important to the aesthetics of daily life is and how steampunk justifies “the cultural investment in beauty; in beauty as something that everyone deserves, that should be a part of our lives like water and oxygen are, no matter what your economic situation is, no matter who you are or where you come from, period.”2 Her husband Daniel had a different take on clothing as a de Certeauean tactical method to combat the instilled conformity of the quotidian. He describes his attire during our interview as his “hospital administrator drag,” consisting of a pressed dress shirt with French cuffs, a suit “specifically tailored for my idiosyncratic frame,” antique cufflinks and a bow tie designed by a friend of his, calling his steampunk style a “costume” “the turning of what is intended to be a uniform, intended to minimize the opportunity for individual expression, a marker of conformance, becomes a way for me to express my individuality and have a lot of fun doing it, while still obeying the rules I have to obey in order to live the life I want to live.”3 Both Mary and Daniel emphasize in their comments how aesthetics are used as a defensive and an offensive tactic against what they view as a drab, conformist world. In Romain Parllardy’s Salon, though, both the mind and the self undergo attentive care and maintenance. The second meaning of the word salon comes from the European cultural tradition that began during the Enlightenment era of gatherings for intellectuals and artisans. 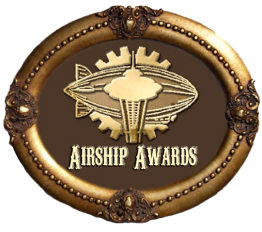 The Steampunk Salon Meet-ups that take place in Romain’s business certainly cannot be compared to the literary one of Paris, but have become a significant opportunity for newcomers and established members of the community to engage with one another. Romain himself is relately new to the steampunk experience; when he first discovered the aesthetic, he immediately looked to the Internet to find like-minded people, which had eventually led him to establish the Steampunk Salon with the help of subculture participants Samuel Sobek and Brandon Herman. At the last Salon Meet-up I had attended in February, I saw many new faces that were also connected through the social media website. In keeping with the literary roots of historical salons, usually, a book is selected beforehand and discussed at these mixers, but this month, socializing and other projects were highlighted instead. A motorized scooter was being disassembled in the middle of the front hallway, scattering engine parts as a sort of welcome sign to incoming guests. People lounged in a hodgepodge of plush, wingback chairs and padded stools, munching Italian cookies and sipping soda. After the Meet-Up, I arranged several interviews with the attendees, including Samuel Sobek. A refined middle-aged man with a aquiline nose and rounded spectacles, Samuel appears often at events in a period shirt, simple waistcoat and blue jeans; a custom toymaker by trade, Samuel described himself as, “philosophically, I would be part of the Maker category: people who life to up-cycle, people who like to repair things, people who are curious about things, scientific-minded people.” In terms of knowing himself, Samuel never expected to become so entrenched in the New York steampunk community; he only liked meeting people, and, in particular, “Seeing connections that need to be made, making those connections, and hard-wiring them to be a self-sustaining network.”4 The creation of networks is certainly not a new idea, but it does tie in with the philosophy that most understand about the steampunk lifestyle: it involves a sense of old-fashioned neighborhood community building that is re-tooled using today’s technology. Thanks to the internet and the power of social media, more and more people are discovering the aesthetic movement and are able to connect with others. As important as the technologies of our age in fostering technologies of the self, the love of beauty, history, and knowledge all interlink these people’s lives. With the Steampunk Salon, the communication of beauty creates an imagined community as the movements aesthetically-pleasing objects attract more and more outside attention as their virtual images are reproduced and disseminated across various technological platforms. Though the experience of beauty is singular, the affect of beauty is only possible through the collective, piecemeal impressions of what that singular experience is, and places like Romain’s Salon become bastions of physical and intellectual enhancement where these ideas can be styled upon the body and between sympathetic minds. 1 Michel Foucault, “Technologies of the Self.” Except from L.H. Martin, et al. Technologies of the Self: A Seminar with Michel Foucault, (London: Tavistock),16. 2Mary Holzman-Tweed, Interview, March 1 2012. 3Daniel Holzman-Tweed, Interview, March 1, 2012. 4 Samuel Sobek, Interview, February 29, 2012.